Been bizzy fishing and getting the shop ready for the weekends opening and for Collingwood to win the grandfinal....Go Pies!!! 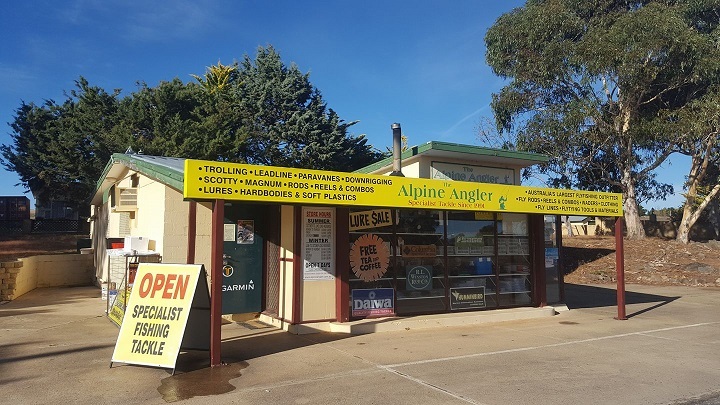 The hardest thing about fishing up here in the snowies at the moment,is making the decision on which lake to fish!.All three major lakes are fishing terrific and all offering different opportunities. Its been a long time coming,but Eucumbene is on the rise and its likely to do so as the snow melt makes its way down to the lake as well as the portal from Tantangarra feeding the river.Its a welcome change to the bank angler and launching of the boat from battling through mud to a much firmer footing.Spin fishing over the yabby beds has been producing amazing days at seven gates,rushies bay,Buckenderra and Braemar with soft plastics,strike pro flatz minnow,bullets and #4 celtas.Bait fishing has also been very productive with everyone enjoying great results on scrubworms,powerbait and grubs.Trolling the ever reliable Tassie Devil,bullet,strikepro flatz minnow has kept up the reputation Eucumbene has built of 1 of the mainlands finest wild trout fishery.Reports of 30 to 40 quality well conditioned fish healthy fish in a weekend.Its great to see all anglers respecting regulations by only taking their bag of 5 or less and practising catch and release on the rest.Fly fishing has been very rewarding all year so far and beginning to get even better.Blind fishing large wets like buggers and Simpsons down and around the boulders or treed margins is as good a way to bump into a trout as anything and once the right bank has been located,there is usually no need to go wandering off to far to try to find another fish.Dry fly fishing has always been a bit of a sketchy one of late on the lake,but i always am prepared for it just incase.I like to have a few size 18 klinkhammers in brown...dont know how important the colour thing is...but i run on confidence so its my go to...griffiths gnat size isnt my worry with this one and quite often use it as an indicator to a buzzer for when the time comes that the midge are in enough abundance for the trout to lock in on them...And lastly a shaving brush in 16...for the duns..Tantangarra rose above 50% before the portal opened and helped the euc river to rise Eucumbene.Prior to this Tangtangarra had a lot of new grassed ground covered and the fish were strangely a little slow to react.A few fish were taken off the bank but the boat anglers faired the best if they could locate where the start of the submerged old lake edge and grass.As the lake dropped the edge fishing,particularly polaroiding with fly stepped up to cover any dissapointments.Placing a pheasant tailed nymph to a fish less than 1 ft off a steep edge of a huge lake is something i will never get sick of.Night time fishing the shallow bays of Tangy with mudeye style imitations is an awesome way to spend a few hours after dinner and can sometimes be the best way to connect to a mystery of the dark! Although i do regard this lake as being the most reliable still water evening hatch venue in the snowies.#18 Klinkhammer (brown of course) griffith gnat red tag and shaving brush is all you really need...Bait fishing has been good with best times easily those hours just before and after dawn and dusk.Scrubworms and grubs fished with as least weight as possible or mudeyes under a running float into deeper areas during the day and in close at night.Trolling with most lures in white has seemed to be a recent trend and while it works,go with it! Clown tassies and white widow bullets are accounting for their fair share lately but then again,so have rapala spotted dogs so u can make the call on that one! Jindabyne has gone from a bit of a hit and miss type of fishery over the past recent years,to a much better consistent producer.Brown trout have appeared in great numbers and in superb condition throughout the year to all methods and are continuing to do so.The supplementary stockings of rainbow trout to add to its own wild naturally occuring population aswell as anual brook trout and atlantic salmon stockings has produced exciting and mysterious fishing.Its a thrill to wonder what you may have on the end of your line and it could be any of the 4 species.Some like to target the huge Atlantic salmon by trolling big flashy lures or some go the more subtle approach with bullets,strikepro flatz or tassie devils in hope of snowies grand slam of all 4 species in the 1 day.Jindabynes banks have been just as good of an option with both bait and spin fishos doing great with blades and Celtas around dawn and dusk with tassies and bullets better through the day.Bait fishing with scrubworms,grubs ,powerbaits chunky cheese and salmon eggs the main areas of jindabyne such as curiosity rocks,hatchery bay and also over at kalkite being popular spots.